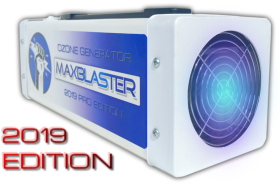 Introduction to our 2019 Edition MaxBlaster ozone generators. All new and improved ozone machines, odor removal guide, comparisons, accessories, special offers, and more. Look for more instructional videos coming soon! Get answers to the top ten questions people ask me about our MaxBlaster ozone generators. Includes the basics you should know before purchasing an ozone machine. Contact me if you have questions about how to use ozone like a pro to remove odors. Watch this simple trick to boost the performance of your ozone generator. Increases ozone production, distribution, longevity, and overall efficiency. Buy one in our store today or ask me where you can buy one on Amazon for even less money. Preview our new Performance Package which includes all the accessories I use myself when using my ozone machine. Includes case, timer, hose, and turbo fan accessory. Visit the 'special offers' page of our store to view current prices. Take a look as we treat a huge 30,000sqft restaurant with MaxBlaster ozone machines. The historic Mt. Fuji restaurant provided us the perfect opportunity to use our full arsenal of ozone generator equipment. Check out this promo video from several years ago that I made to promote our ozone treatment services. It's a little gimmicky but you may find some valuable tips if you are thinking of promoting your own pro ozone cleaning service business. Watch an introduction to MaxBlaster ozone generators in this quick video that has appeared on our website since 2013. It contains much of the same info from our 2010 intro video only with slightly higher video skills. Wow this video brings back some memories of our original shop. It proves we've been doing the same thing for ten years while still maintaining our original concept... high output ozone made with industrial strength components with no unnecessary features or gimmicks!